Women’s ‘Acuty’ pink mini dress with two front pockets and pleated detail to the back from BOSS Orange. 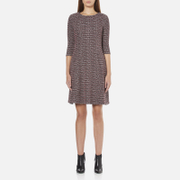 Crafted from a finely textured fabric, the slightly loose fit dress features a round neckline and capped sleeves. Complete with a rear zip closure, a full lining and a signature metal BOSS Orange brand tab above the hem. Main: 100% Polyester. Lining: 92% Polyamide, 8% Elastane. Model is 178cm/5'10 and wears a size 10. 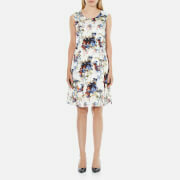 Women’s ‘Ameschy’ dress with an all over watercolour print from BOSS Orange. Crafted from a smooth silk blend fabric, the sleeveless dress is gathered around the waist and features a round neckline. Complete with an integrated lining, a gold-tone zip on the back and a signature metal BOSS Orange brand tab above the rear hem. Main: 68% Viscose, 32% Silk. Lining: 92% Polyamide, 8% Elastane. Model is 175cm/5'9 and wears a size 10. Women's leather-inspired dress from BOSS Orange with an A-line silhouette. Crafted from finely grained fabric, the regular fit 'Apelilly' dress showcases a round neckline, short sleeves and two oversized patch pockets to the front. Accentuated with an exposed rear zip fastening and seam detailing throughout. A metal BOSS Orange tag with signature orange stitching completes the design. Outer: 100% Polyester. Lining: 51% Polyester, 49% Cotton. Model is 178cm/5'10 and wears a size EU 32. Women's 'Ivahida' black jumper from BOSS Orange. Crafted from a soft cotton blend, the relaxed fit sweater comprises a round neckline, long sleeves and a metal zip fastening to the reverse that can be worn open or closed for versatile styling. A BOSS Orange tag with signature orange stitching completes the design. Body: 50% Viscose, 32% Cotton, 9% Virgin Wool, 5% Polyamide, 4% Silk. Back Panel: 65% Viscose, 35% Silk. 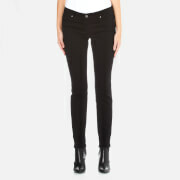 Model is 178cm/5'10 and wears a size S.
BOSS Orange slim fit black jeans with a stretch cotton construction. Showcasing a classic five pocket design, the 'J20 Berlin' mid-rise skinny jeans feature a button closure, zip fly and belt loops. Complete with tonal stitching and a branded patch at the reverse waistband. 93% Cotton, 5% Polyester, 2% Elastane Model is 178cm/5'10 and wears a size W27. 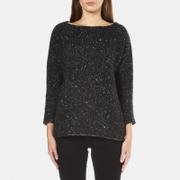 Women's 'Widianna' speckled jumper from BOSS Orange. Crafted from Italian yarn wool with alpaca and silk, the quality sweater showcases a boat neckline, cropped sleeves and an all-over contrasting flecked design. A BOSS Orange tag with signature orange stitching is situated above the hem. 59% Virgin Wool, 16% Alpaca, 12% Silk, 7% Mohair, 6% Polyamide Model is 178cm/5'10 and wears a size S.
Printed ‘Been There’ dress from C/MEO COLLECTIVE. Falling to the mid-thigh in a flared design, the dress comprises a V-neckline, concealed zip fastening to the rear and long sleeves with triple buttoned cuffs in a stripe print. Constructed with a draped, wrap front, the ‘Been There’ dress is lined and finished in an all-over scarf print. Main: 100% Viscose. Lining: 100% Polyester. Model is 175cm/5'9 and wears a size S/UK 8. Women’s navy, ‘Lous Places’ dress from C/MEO COLLECTIVE. Crafted from a structured, heavy-weight fabric, the dress is constructed with a fitted bodice and a pleated, flared skirt that falls to the mid-thigh. Featuring an off-the-shoulder neckline and a concealed zip fastening to the rear, the dress is complete with long, flared sleeves. Main: 100% Polyester. Lining: 100% Polyester. Model is 175cm/5'9 and wears a size S/UK 8. Women’s white shirt dress from C/MEO COLLECTIVE. Crafted from pure cotton and cut for a loose fit, the ‘Show Me Shirt’ dress comprises a point collar, concealed button placket fastening and long sleeves with a cut away shoulder design. Falling just below the knee, the dress is complete with vented side seams and a self-tie waist belt to cinch in the waist and create a feminine silhouette. 100% Cotton Model is 175cm/5'9 and wears a size S/UK 8. Grey ‘There Is A Way’ jumper from C/MEO COLLECTIVE. Crafted from a ribbed knit and cut for a fitted, cropped fit, the jumper comprises a contrasting crew neckline and matching hem. 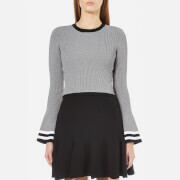 Complete with long, bell sleeves with striped, black and white flared cuffs. 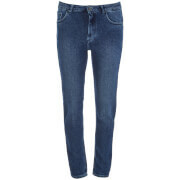 62% Viscose, 37% Nylon, 1% Elastane Model is 175cm/5'9 and wears a size S/UK 8.